The Latin Crusaders manning the battlements were armed with spears, axes, and crossbows. They shared with each other a desire to fight and die for the Cross. They stood atop a dozen towers and along the mile-long landward walls that guarded one of the greatest ports in the Outremer. It was April 6, 1291, and a vast Muslim host had arrived before the tower-studded walls of Acre determined to take it forcibly from the Crusaders. The Crusaders watched the spectacle unfold beneath them as thousands of Muslim warriors prepared to die for Allah fanned out across the plain east of the city. Garbed in robes of bright colors and carrying banners of brilliant designs that dazzled the eye, they had come from lands near and far. Men from Arabia, Egypt, Jazira, Palestine, and Syria gathered on the distant hills and the arid plateau ready to fight under Crescent banners. Egyptian Mamluk Sultan Al-Ashraf Khalil’s 45,000-strong army outnumbered the 15,000 Franks and their allies three to one. Khalil’s army possessed intimidating siege engines capable of damaging the city’s double-walled defenses, while Syrian sappers tunneled under the walls in an effort to collapse a section through which the attackers could stream into the city. The Crusader cause in the Near East had been in a downward spiral since the poorly executed Seventh Crusade had ended in disaster with the surrender of French King Louis on April 6, 1250, to the Ayyubids in Egypt. That same year, a coup in Egypt had replaced the Ayyubid Dynasty, whose rulers were descendants of Sultan Saladin, with the Mamluk Bahri dynasty. Before the Mamluks could turn their attention to the Franks, though, they had to stop the Mongols from reaching Egypt. Under Hulagu Khan, a grandson of Ghengis Khan, the Mongols overran Mesopotamia in 1260 and captured Baghdad. The streets of Baghdad ran red as the Mongols butchered thousands of Muslims who belonged to the Abbasid Caliphate. Hulagu sent a Mongol army under Kitbuqa to force the Mamluks to acknowledge the Mongols as their overlords. On their march to check the advance of the Mongols, the Mamluks requested permission to pass through Frankish territory. The Franks hated the Mongols even more than the Mamluks and therefore granted permission to Sultan Saif ad-Din Qutuz to march through the Latin Kingdom of Jerusalem and intercept the Mongols in Galilee. The two great powers collided at Ain Jalut on September 3, 1260. Sultan Qutuz, with Mamluk general Baibars al-Bunduqdar leading the vanguard, won a decisive victory over the Mongols. Mamluks were Turkic people whose ancestral home was the vast steppe lands of Central Asia. In the brutal world of the steppes, nomadic tribes were frequently at war with each other. Following a battle or raid, the conquerors would sell the women and children they had captured to slave traders. The slave traders in turn sold the young boys to members of the Muslim Abbasid and Fatimid Caliphates of Iraq and Egypt, respectively. The boys were converted to Islam and trained in the art of warfare to serve their Fatimid or Ayyubid overlords as loyal soldiers. Mamluks were great warriors, and they were feared and respected by their opponents in battle. Qutuz had been in power only for 11 months when he was assassinated on his way back to Cairo from Ain Jalut. Baibars had a personal vendetta against the sultan, and he arranged his assassination. To legitimize his ascension to the office of sultan, Baibars installed as caliph in Cairo an Abbasid prince who had survived the Mongol massacre in Mesopotamia. Baibars did this to give himself greater legitimacy not only within Egypt but also throughout the Muslim world. Although the Franks had recovered Jerusalem for a short time in the mid-13th century, they had lost it for good in 1244. By the time of Ain Jalut, the once expansive Latin Kingdom of Jerusalem was nothing more than a rump kingdom. If not for the strong presence of major military orders, such as the Knights Templar, Knights Hospitaller, and Teutonic Knights, and the maritime support of merchant republics such as Genoa, Pisa, and Venice, the kingdom would have fallen many years before Sultan Khalil’s army arrived before its walls in April 1291. The sad reality was that the military orders squabbled incessantly among themselves, as did the rival maritime powers that helped prop up the kingdom. The situation was exacerbated by the fact that the Kingdom of Jerusalem did not have a resident monarch for much of the 13th century. Despite its ever-shrinking borders, the kingdom retained a strip of fertile land along the coast of Palestine and Lebanon that boasted orchards, sugar plantations, and olive groves, but these precious agricultural assets required constant surveillance to protect them from Muslim raiders. The Mongols under Hulagu Khan overran Baghdad in 1258, ending the longstanding Abbasid Caliphate. Afterward, the Mongols advanced into Syria, a move that threatened the authority of the Mamluks over the extant Ayyubid princes. 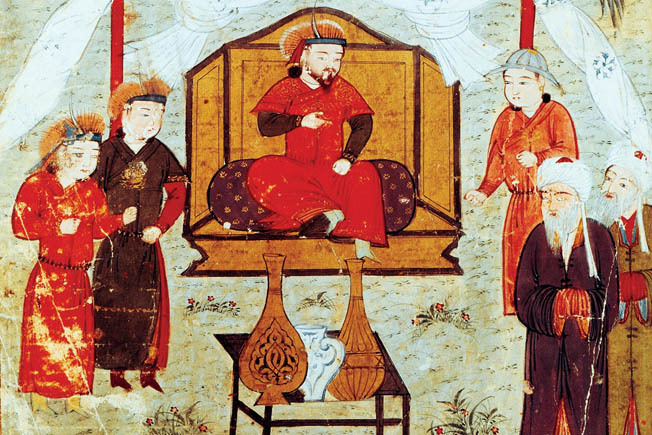 While keeping a watchful eye on the Mongols, Sultan Baibars turned his attention to grabbing towns, castles, and parcels of territory from the vulnerable Franks. Baibars was an excellent horseman who was skilled in the use of bow and sword. He had a seemingly inexhaustible amount of energy and often stayed up into the deep hours of night while on campaign writing and signing dozens of dispatches pertaining to political and military matters. He believed in inspiring his men by example and often helped with engineering tasks when the Mamluks laid siege to a Frankish stronghold. But Baibars could not devote all of his time to prosecuting the Mamluk war against the Franks because the Mongols were constantly threatening Mamluk territory in Syria. Nevertheless, Baibars was still able to amass a string of victories against the Franks during the 17 years in which he served as the Mamluk sultan of Egypt. Baibars began steadily chipping away at Frankish territory in 1263 when he established a base in Galilee from which he razed Nazareth and the Hospitallers’ stronghold on Mount Tabor. In many cases, he had his men demolish a captured fortress so that the Crusaders could not reoccupy it at a later date. 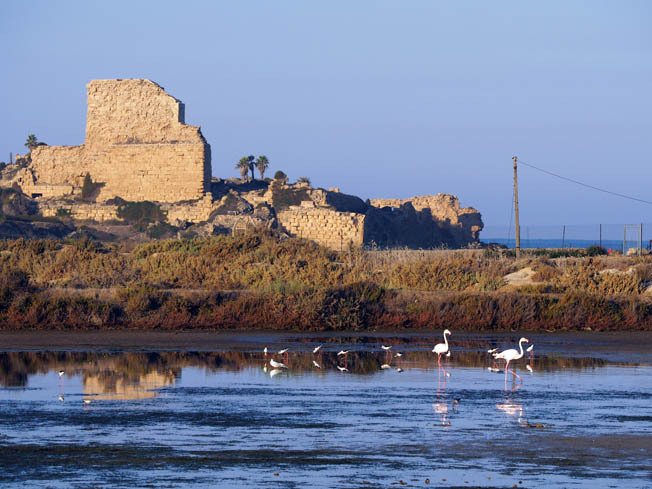 For example, when Baibars and his troops captured the Frankish port of Caesarea in February 1265, Baibars grabbed a pickaxe and helped his men dismantle the citadel stone by stone. In the 1266 campaign against the Franks, Baibars completed his conquest of Galilee by capturing the Templar castle at Safed. He made a show of force before Acre the same year but deemed it too strong to capture. The Crusader castles fell like dominoes to Baibars’ army. In the following years, he captured Beaufort, Chastel Blanc, Gibelacar, and Krak de Chevalier. His greatest achievement, though, was the capture of Antioch in 1268. During the sack of the city, Baibars approved the massacre of its inhabitants to the shock of both Christians and Muslims. The 56-year-old sultan was in Damascus preparing to counter a Mongol offensive when he died on July 1, 1277. He left the Franks sorely crippled and a ripe target for future sultans. After a two-year period of instability in which two sultans, each of whom ruled for a short time, succeeded Baibars, Sultan Al-Mansur Qalawun came to power in 1279. Pressure from the Mongol Ilkhanate of Iran-Iraq, which threatened Mamluk control of Syria, forced Qalawun to deal first with the Mongol threat before turning his attention to the Franks. The Mamluks defeated the Mongols in a pitched battle at Homs in December 1281. The Mongols were joined in the battle not only by the Armenians of Cilicia, but also by a detachment of Knights Hospitaller from Margat Castle. From that point forward, Qalawun had a vendetta against the Hospitallers. Four years later, the sultan captured Margat after a month-long siege. After a long period during which there was a power vacuum in the monarchy of the Kingdom of Jerusalem, 15-year-old King Henry II of Cyprus was crowned King Henry II of Jerusalem in a ceremony held in Acre on August 15, 1285. Thereafter, he held both crowns. Henry’s uncle, Philip of Ibelin, agreed to serve as bailiff of the Kingdom of Jerusalem, and the young king returned to his residence in Cyprus. In March 1287, Qalawun’s Mamluks took control of the port of Latakia, and two years later they successfully captured the port of Tripoli. The two Mediterranean ports were the last remaining possessions of the Latin Principality of Antioch and the County of Tripoli, respectively. At that point, the Kingdom of Jerusalem was all that remained of the four Crusader States established in the aftermath of the successful First Crusade. Fearing for the existence of the Kingdom of Jerusalem, King Henry negotiated a 10-year truce with Qalawun in August 1289. Knowing that the truce might be violated at any time, Henry sent a delegation to Western Europe to request immediate reinforcements. Although none of the monarchies sent large numbers of reinforcements to assist the Kingdom of Jerusalem, the republic of Venice sent 3,500 Italian foot soldiers. They arrived in Acre in the summer of 1290. About the same time, English knight Otto de Grandson arrived with 50 English men-at-arms to buttress the English military order known as the Order of St. Thomas. The Italian soldiers in Acre lacked a strong leader to instill them with discipline. They were unfamiliar with the trading customs by which Muslim merchants and local farmers were allowed to come and go as they pleased through the marketplace of the great city. In late August, the streets were crowded with men from many localities, including Muslim merchants from Damascus and Muslim farmers from Galilee. At one point, a riot broke out when a few of the Italians brutally attacked some of the Muslim merchants. A number of innocent Muslims were slain during the street fight before some of the Hospitallers and Templars intervened. As many as 50 Muslim merchants and farmers were slain in the disturbance. Family members of the slain Muslims travelled to Cairo where they begged Sultan Qalawun to intervene in the matter. Some of them brandished the bloodstained clothing of their relatives as proof of their deaths. Qalawun subsequently demanded that Acre officials turn over the perpetrators of the murders. Realizing the seriousness of the situation, Templar Master William of Beaujeu sent a delegation to Cairo in October to offer apologies and financial compensation. When the sultan pressed the Franks to turn over the perpetrators, Beaujeu refused. Qalawun was furious. He subsequently requested and received permission from Islamic officials in Cairo to break his truce with the Franks. The sultan immediately began planning an offensive campaign for the following spring. 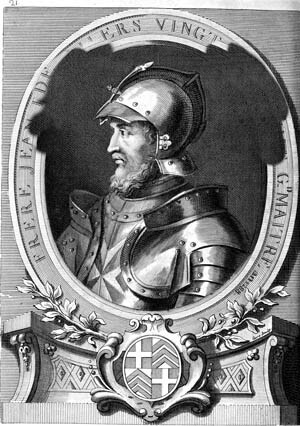 Beaujeu learned shortly afterward from Latin spies in Cairo that the Mamluks planned to attack Acre. Qalawun died unexpectedly on November 4. It fell to his 30-year-old son, Sultan Khalil, to march against Acre. He issued immediate instructions to Mamluk and allied Muslim forces in Syria to build additional siege machines. The Muslims ultimately would bring with them to Acre 15 giant trebuchets capable of firing 100-pound stones, according to Muslim chronicler Abul-Mahasin. “The sultan ordered all other fortresses to send catapults and siege engines to Acre, and in this way a great number of large and small artillery concentrated under its walls, more than had ever been assembled in one place,” wrote Arab chronicler Abu’l-Fida. Mamluk Sultan Baibars besieged the Templar fortress of Chateau Pelerin, also known as Athlit, 15 miles south of Acre in 1265, but he failed to capture it. After Acre fell, the Templars simply abandoned it. Whereas Crusaders and Muslims had traditionally built their siege engines on site and then destroyed them, by the 13th century the Muslims transported their largest siege machines from storage areas at castles and cities to the location of a new siege. Although referred to by several different names, the stone-throwing machines by that time were all of the trebuchet design. The basic model used the traction method whereby a team of men dragged the short end of the central beam, which was positioned in a cradle-like structure, downward to launch the long end with the projectile in a sling upward in a wide arc. But this method was substantially improved in the Latin Crusading era by the introduction of the counterweight method. While the stones could cause great damage to the battlements, they were not strong enough to knock down the thick walls. The breaches were almost always made by sappers. The sappers dug a tunnel beneath the wall, placed timbers to hold up the wall, and then set fire to the timbers. This sent the wall crashing down. Once the wall collapsed, the attacking force had to move swiftly to exploit the breach before the defenders conducted a partial repair to thwart the attack. Throughout the existence of the Latin Kingdom of Jerusalem, Acre had served as its key port. The waters of the harbor were shallow, though. For that reason, larger vessels anchored in deep water, and oar-driven boats ferried passengers and cargo back and forth between the quay and the cogs and galleys. King Baldwin I of Jerusalem had captured Acre in 1104. Although Saladin retook it for the Muslims in 1187, he lost it to King Richard I in 1191 during the Third Crusade. Before 1198, the old city had been protected only by a single wall, but over a 14-year period an east-facing outer wall was built around the old city and double walls were built to the north to enclose the adjacent town of Montmusard. Although once lightly populated, Montmusard’s population had swelled as refugees poured in during the 1280s from towns and villages captured by the Mamluks. The Crusaders deployed mostly on the inner wall with some units taking up forward positions on the outer walls. The Crusader army was composed of 1,000 knights and 14,000 foot soldiers of various nationalities, including English, Frankish, German, and Italian. The three major military orders had their Levantine headquarters in Acre. The Knights Templar had the grandest quarters, which consisted of a citadel overlooking the harbor, and the Knights Hospitaller and Teutonic Knights had compounds in the old city. Minor military orders such as the Order of St. Thomas and the Order of St. Lazarus also contributed troops to the city’s defense. The major military orders manned the three-quarter mile stretch of the landward walls that protected Montmusard and the north side of the old city. On that stretch, the Knights Templar held the left, the Knights Hospitaller held the center, and the Teutonic Knights held the right. The secular troops manned the remaining one-quarter mile length of wall, which included the easternmost section of the north wall and the entire east-facing wall surrounding the old city. 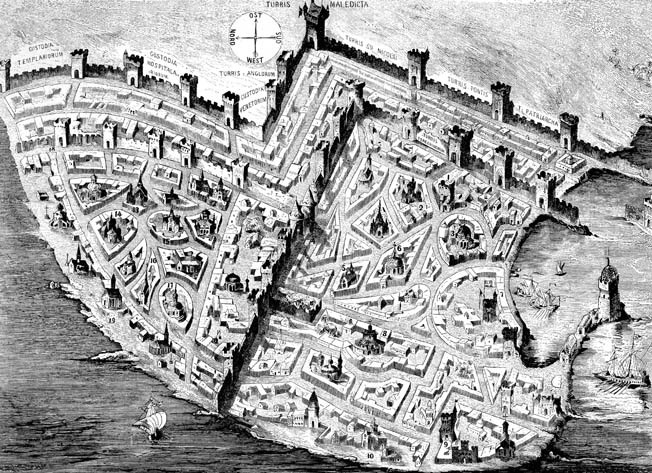 The Pisans and Venetians operated trebuchets located in key positions from which to shell the besieging forces. The masters of the major orders also were present to direct their forces. They were Templar master Beaujeu, Hospitaller master Jean de Villiers, and Teutonic master Konrad von Feuchtwangen. Other noteworthy commanders who would play key roles in the upcoming battle were King Henry, his brother Almaric of Lusignan, Hospitaller Marshal Matthew de Clermont, French commander Jean de Grailly, and English commander Grandson. To increase the size of his force, Sultan Khalil ordered the Ayyubid and Mamluk forces in Syria under his rule to join him at Acre, according to Abu’l-Fida. The sultan “marched on Acre with his Egyptian troops and sent word to the Syrian army to join up with him and to bring the siege engines,” he wrote. Damascus-born Abu’l-Fida was an officer serving in the Ayyubid army of al-Malik al Muzaffer III, the emir of Hama. Sultan Qalawun’s siege of Tripoli in the spring of 1289 was a dress rehearsal for Acre two years later. The Mamluks captured it in just four weeks because it was weakly fortified. After its capture, the victorious Mamluks slaughtered the noncombatants while most of the Crusaders evacuated by sea. The Muslims were unable to starve the garrison because the Crusaders controlled the sea and were easily resupplied from Cyprus. For that reason, they had to take the city by storm. The double walls precluded a quick assault, so Sultan Khalil and his generals planned to batter the walls while highly skilled Syrian sappers tunneled beneath multiple sections in an effort to collapse one or more sections. Once a breach was created, dismounted Mamluks would fight their way into the city. On April 5, Sultan Khalil pitched his bright red royal tent on a hill east of the Tower of the Legate, one of the 12 square towers on the double walls that protected the landward side of the ancient city. The door of his great tent opened directly toward the city. The Mamluks and Ayyubids spent the first day building mobile palisades and wicker screens, which they intended to use for protection as they advanced against the outer walls. The next day they fanned out the entire length of the landward walls. “They set up great barricades and wicker screens, ringing the walls with them the first night, and the second night they moved them further in, and the third night further still, and they brought them so far forward that they came up to the lip of the [ditch],” wrote the Templar of Tyre. The division between the old town of Acre (at right) with its harbor and the suburb of Montmusard can be discerned in a 19th-century engraving. The Franks were well aware that they were in grave danger, but as usual they were ready for the bloody, protracted fight that lay ahead. During the first week there was constant skirmishing. “The Franks did not close their gates, but left them open and fought in them,” wrote Abu’l-Fida. He fought on the right wing with the army of Hama opposite the walls held by the Knights Templar. At the beginning of the second week, the Muslims began battering the walls with their trebuchets. The gigantic trebuchet named Victorious was deployed on the left flank to bombard the Pisans, and another gigantic trebuchet named Furious was deployed on the right flank to bombard the Templars, according to the Templar of Tyre. The Muslims also used an antipersonnel weapon known as the caraboha, which fired javelin-sized bolts in rapid succession, according to the Templar of Tyre. “In the places where the carabohas were firing, no one wanted to come out into the open,” he wrote. Muslim spearmen and archers were stationed in trenches and behind the palisades and screens. Their job was to skirmish with the Crusaders at the gates and also furnish protection for the sappers. On August 13 the ragtag Crusader navy sailed within missile range of the extreme right of the Muslim army where Abu’l-Fida was stationed. A handful of Latin merchant ships converted for wartime use swept in close to shore not far from the white tents of the Muslims. The crews had retrofitted the ships with rectangular shields to protect the archers and crew from enemy fire. Crossbowmen stationed in forecastles and sterncastles fired on the Muslims nearest the shore, forcing the Muslims to take cover behind the dunes. One of the Latin vessels mounted a large siege engine that hurled stones into the sprawling Hama encampment. The ship with the siege engine “caused us distress,” wrote Abu’l-Fida. Fortunately for the Muslims in the Hama camp, a great storm wrecked the vessel with the artillery. “It was smashed to pieces and never bothered us again,” he said. The Crusaders also attempted to throw the attackers off balance by night sorties in which they sought to burn the Victorious trebuchet deployed on the Muslim left flank. The first of these attacks occurred on the night of April 15-16. Templar Master Beaujeu and Grandson led the attack in which the Crusaders sought to torch the giant contraption. Otto de Grandson, led the English troops at Acre. Even though a clear sky and moon made it relatively easy for the Crusaders to see where they were going, the raid was botched when some of the Crusaders tripped over ropes anchoring the Muslim tents. The noise alerted the Muslims, who engaged the Crusaders. The Crusader who was entrusted with hurling a jar filled with naphtha at the trebuchet threw it too soon, and it exploded short of the target. Al Muzaffer, the emir of Hama, “rallied his troops to him and hit us on the seashore with showers of javelins, wounding some of our men,” wrote the Templar of Tyre. The Muslims killed 18 Templar and English men-at-arms. One unfortunate Crusader fell into the emir’s latrine and was promptly slain. The Templar of Tyre claims that there were as many as 300 mounted knights, sergeants, and auxiliaries involved in the raid and that they faced 2,000 Muslims. These clearly exaggerated numbers simply indicate that a significant number of soldiers on both sides were involved. A second sortie took place on the night of April 18-19. The Hospitallers led this particular attack, which targeted the center of the Muslim line. The sortie was launched spontaneously on an overcast night in which there was no moonlight. “This was decided so secretly that no one knew of it until the command ‘To horse!’ was given,” wrote the Templar of Tyre. The mounted raiders departed from the Gate of St. Anthony and apparently targeted the Hama encampment. Somehow the Muslims had learned of the attack, and they used torches to illuminate their surroundings. When the Hospitallers appeared, a squadron of Muslim cavalry launched a counterattack that drove the Crusaders back to the city. A third Crusader sortie occurred on the night of April 20-21 when Beaujeu led an attack against the left flank of the Mamluk Army of Egypt aimed once again at damaging the Victorious trebuchet. The Muslims again received advance warning of the attack. They drove the Crusaders off before they could cause any damage. On May 4, King Henry of Jerusalem arrived by sea from Cyprus to take command. Because of his young age, though, he relied heavily on the masters of the major orders, and also on the senior English and French commanders. Henry brought with him the last major group of reinforcements, which consisted of 100 Cypriot knights and 2,000 foot soldiers. Henry sent a delegation on May 7 to discuss terms with Sultan Khalil, but the overwhelming desire of the Mamluk rank and file, who shouted that they wanted the battle to continue, encouraged the sultan to press the siege. The following day, the Muslims drove a detachment of Crusaders manning an outer work known as King Hugh’s Tower from their position. Almost immediately, several detachments of sappers began tunneling beneath King Henry’s Tower, a key position in the outer wall at a salient where the north and east walls protecting the old city met. 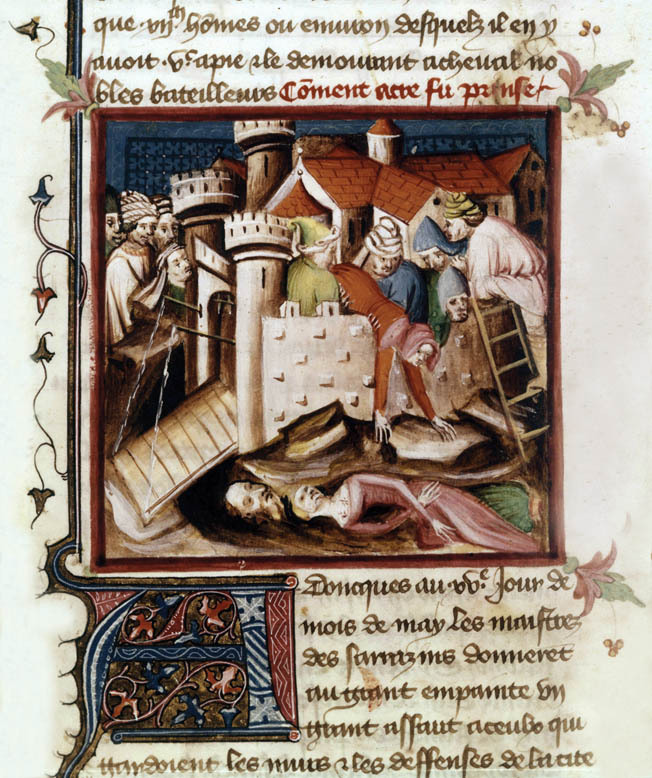 After eight days of nonstop labor, on May 16 the Muslim sappers brought down a section of King Henry’s Tower and the sections of the outer wall immediately adjacent to it. “The sappers had so badly undermined [King Henry’s Tower] that the front face fell in a heap into the fosse, so that it was impossible to pass over the top of the stones,” wrote the Templar of Tyre. To make it passable, the Muslim engineers piled sand atop the rubble and crafted a smooth pathway for the attacking troops to march over as they entered the breach. The elated Muslims planted the sultan’s banner on top of the rubble to claim the position. The position came under bombardment by Crusader trebuchets, but the Muslims took cover and waited out the storm of stone. Grand Master Jean de Villiers, right, led the Hospitallers. Despite the leadership of many stalwart Crusader captains, the Christians were outfought by the determined Muslims. Having abandoned the tower, King Henry and his troops reformed that night on the inner walls in anticipation of renewed fighting. That same day the Syrian Mamluks had launched a major assault against the Latin military orders at St. Anthony’s Gate, but the Templars and Hospitallers led by their veteran commanders held the gate despite daunting odds. Sultan Khalil and his generals spent May 17 preparing their forces for a general assault the entire length of the Acre defenses, set to begin before dawn the following day. Their primary target, however, was the Accursed Tower on the inner wall, which was situated directly behind King Henry’s Tower. In anticipation of the renewed fighting, the Crusaders abandoned their last positions on the outer wall and consolidated their position on the inner wall. The relative quiet of the night was shattered just before dawn by the sounds of drums and trumpets signaling the beginning of the major Muslim attack. “They beat their drums, creating a terrible, terrifying noise, and the army massed under its walls,” wrote Abul-Mahasin. Wild-eyed Mamluks determined to carry all in their path charged over the smooth pathway the engineers had made for them to get through the rubble of the King Henry’s Tower. A small detachment of Crusaders had remained in an advanced position in front of the Accursed Tower to delay the onslaught. The Christians fought from a position consisting of a wooden frame with an outer covering made of leather to protect them against arrows and javelins. 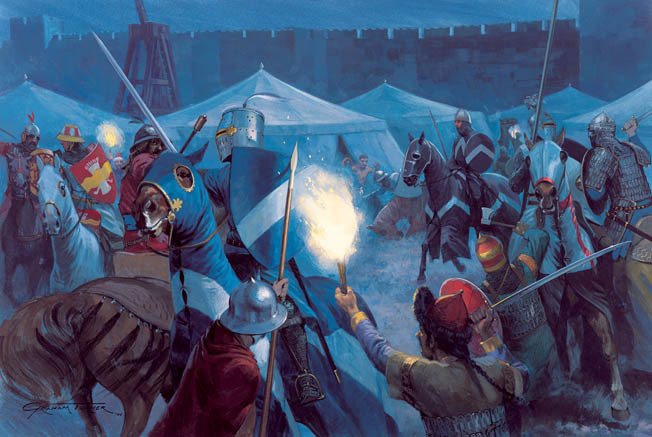 Muslims scramble to repulse a night sortie by mounted Crusaders at Acre. 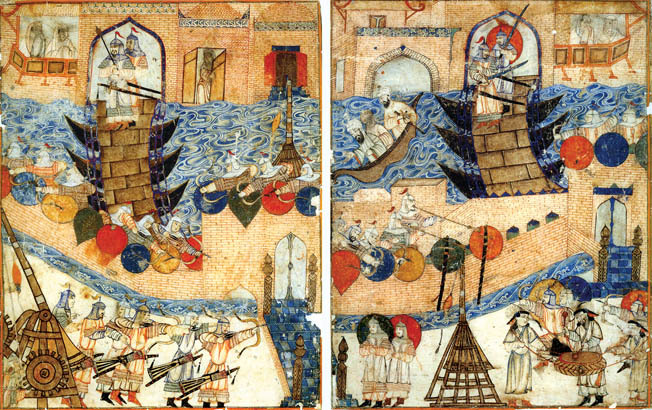 Several sorties aimed at damaging the Muslim trebuchets had no influence whatsoever on the outcome of the battle. Half of the Mamluks who gained access to the inner passageway by storming through the breach went west toward St. Anthony’s Gate, and the other half ran south toward the area where the English, French, and Italians defended the old city. Hospitaller Marshal Claremont, who wielded a battle axe, rallied his warrior-monks and other troops in the sector in a spirited defense against the fanatical Mamluks. Elsewhere, though, the Crusader positions were crumbling. As the Muslims advanced, their archers maintained a steady fire to give cover to those armed with axes, maces, and swords. The Muslim attack on the Accursed Tower was successful, and this gave them direct access to the city. One by one the towers on the east end of the old city fell to the Mamluks. Once inside the city, the Muslims were able to attack the other towers from the rear where they were lightly defended. The Muslims also opened the gates to the rest of the army, and hordes of additional troops poured into the city. In the east end of the old city, De Grailly and Grandson rallied their men and conducted a fighting retreat west toward the wharf. As the Muslims took control of the east end of the old city, they torched the Pisans great trebuchet. “Everyone they encountered, they put to the sword,” wrote the Templar of Tyre. The only structures that slowed their advance were the fortified compounds of the Knights Hospitaller and the Teutonic Knights. The Muslims prevailed everywhere within the city because of their superior numbers. During the rearguard actions the Crusaders attempted, some of their most illustrious commanders were killed or seriously wounded. Not far from the inner wall, Templar Master Beaujeu suffered a fatal wound. Some of his men, who were not aware of the wound, reproached him for walking away from the fighting, according to De Villiers. “I’m not running away,” he said. “I am dead. Here is the blow.” Beaujeu then raised his arm to show that an arrow had penetrated his mail under his arm. The loss of their revered master was a severe moral blow to the other Templars, and they retreated toward their compound overlooking the harbor. had shown himself to be, in the words of De Villiers, “noble and doughty and wise in arms.” The imposing Hospitaller marshal was finally slain in the melee with the Mamluks near the wharf. The Crusaders exhibited a lack of foresight by not having more vessels ready at a moment’s notice to ferry evacuees from the wharf to the Pisan and Venetian ships waiting in the deep water. The panic increased as those who crowded the quay found only a few small vessels ready to take them to safety. The fall of Acre ended nearly two centuries of Crusader presence in the Near East. The confederated nature of the Crusader States and their disparate forces from many lands was no match for Muslim unity under the Mamluk sultans. Those desperately seeking to escape crowded the oar-driven boats that would ferry them to the galleys and cogs. A number of the small boats capsized from overcrowding. A high-ranking ecclesiastical official, Patriarch of Jerusalem Nicholas de Hanape, drowned when the boat he boarded swamped in the harbor. Among those nobles who escaped by sea were King Henry, his brother Almaric, Grandson, De Grailly, and De Villiers. While Grailly would perish, De Villiers survived. By nightfall the city, except the military order compounds, was in the hands of the sultan’s troops. The Hospitallers and Teutonics surrendered in exchange for amnesty, which was granted. The Templars, however, declined to surrender. They had allowed upward of 2,000 residents and soldiers into their compound to shelter them from the Mamluks. After seven days, the Templars surrendered after agreeing to the same terms granted the other two military orders. 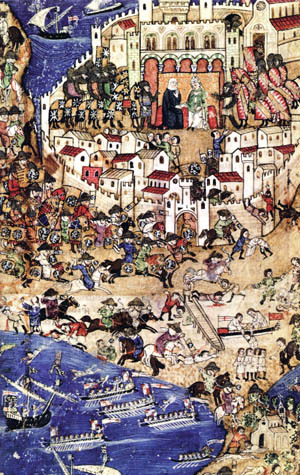 On May 25, 200 Mamluks arrived to oversee its evacuation. When they manhandled some of the women and began sacking the compound, the Templars in a fit of rage shut the gates and attempted to kill or capture those trapped inside. A bloody melee occurred in which soldiers on each side were slain. After the tumult died down, Templar Marshal Peter of Sevrey went under a flag of truce to discuss the incident with Sultan Khalil in his royal tent. Khalil, who was furious with the Templars for holding out so long, ordered Sevrey slain. The sultan then ordered his sappers to bring down a wall of the compound. They succeeded in their mission, and a wall of the great tower of the compound collapsed to the ground. In the wake of his successful siege, Khalil, like Baibars before him, ordered the walls of Acre dismantled so that the Crusaders could not try to retake it in a future invasion. The work, however, was never completely finished for some unknown reason. Nevertheless, the Crusaders were driven from Acre, and after that the Muslims had only to mop up a few remaining outposts, such as Beirut, Haifa, Sidon, and Tartus. By mid-August, these remaining outposts were in Muslim hands. Various strategies for reinvading the Holy Land were floated and discussed in the years to follow but never acted on. Despite their loss, the Crusaders’ two centuries of history in the Outremer remains a vivid part of medieval history. Tags Allies, Armenia, artillery, Asia, assassin, axe, Baghdad, Cairo, Cata, catapult, cavalry, CIA, Confederate, Crossbow, Cyprus, EAM, Egypt, Europe, First Crusade, Franks, French, general, German, Greek, Greek Fire, Henry II, Illustrious, iran, Iraq, Islam, javelin, Jerusalem, King Henry, King Henry II, knights, knights templar, KONR, lance, Lebanon, Mary, medieval history, Mediterranean, Mesopotamia, military, Mongols, Muslim, navy, NSA, OSS, Overlord, Palestine, PC, POW, Richard I, Saladin, SAS, Sling, spear, Squad, sword, swords, Syria, Tern, Teutonic Knights, The Division, Third Crusade, Thor, Tory, Trebuchet, Tripoli, Troy, Tyre, WIN, wounded.